Two new vivo smartphones with model numbers Vivo 1901 and Vivo 1902 have been found in new Geekbench listings today. 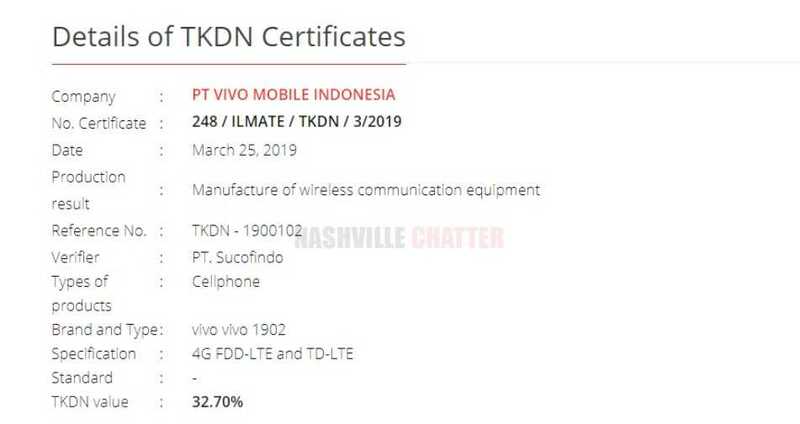 The phone Vivo 1902 has been certified today by the Indonesian certification agency Peningkatan Penggunaan Produk Dalam Negeri (P3DN). As always, the listing in P3DN website doesn’t reveal any details about the smartphone and it just shows the model number of the phone. The Geekbench appearances confirm certain key features of the phones including the RAM, OS and processor used. Vivo 1902 phone is powered by MediaTek MT6765V/CB chipset and it’s nothing but the MediaTek Helio P35 chipset which clocks at 2.30 GHz. Vivo 1901 phone is powered by the MediaTek Helio P22 SoC which is indicated by the processor name MT6762V/CA and this processor clocks at a speed of 2 GHz. Both phones have 2 GB RAM and are is loaded with Android 9 Pie operating system. The specs indicate that these are mid-range offerings from Vivo targeted towards budget users. Recently, we spotted a Geekbench listing for a Vivo phone with model number vivo V1901A with the same MediaTek Helio P35 SoC. Vivo 1902 is the second vivo phone to be spotted with this processor. Vivo V1901A had single and multi-core Geekbench scores as 907 and 4413 respectively whereas vivo 1901 has scores of 764 and 2321 respectively. On the other hand, Vivo 1902 has scores of 820 and 2471. The performance of vivo 1901 and 1902 phones are almost similar despite the difference in processor, with 1902 slightly better than 1901. Vivo 1901A seems to be a mid-ranger with slightly higher numbers on Geekbench and is certainly better than both vivo 1901 and vivo 1902. Vivo has been launching several new phones in the recent past and it has also started releasing a new range of phones in the ‘U’ series. Vivo U1 was released recently and it was found to be the Chinese version of Vivo Y95 phone. These above phones could belong to the U-series or could be something else! It’s difficult to guess the names of these phone at the moment. Let’s wait for more details. We’ll keep you posted.